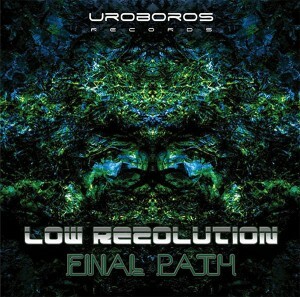 Low Rezolution (Sergio Brentan) returns to Uroboros Records with Final Path, the second full-length album from this Brazilian producer. As always the focus is on dark progressive psytrance with moody atmospheres and plenty of weirdness all around. With the experience gained from years of putting out releases the sound is more refined and highly-polished. Many songs were also created with collaborators from across the progressive psytrance underground. Enjoy these techno-tribal vibrations from the mega-city of São Paulo! Mastered by FluxField Studios (Brazil) with artwork by Harley Dias (Italy) and Joaquim Mutim (Brazil). MP3 Download | FLAC Download | WAV Download · Download count: 7,937.
nice serguki,,mucho bom quality from before,keep it going hommmz , full support n love from here hermango. Wow, nice work, thank you! Production is VERY NICE. Sound is INTENSE. :P BOOM!